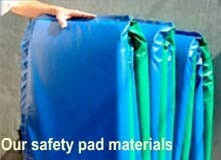 This safety pad will be similar or better than the original pads on trampolines sold through most big box retailers and department stores. What size safety pad do you need? Most round trampolines have either a 12', 13' or 14' diameter frame. The size of safety pad you will need is determined by measuring the diameter of the frame. Measure the frame from 12:00 o'clock to 6:00 o'clock, from the outside of the steel to the outside of the steel.